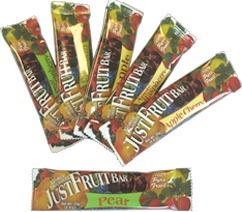 We were just introduced to Gorge Delights® JustFruit™ snack bars. Ken Goe, a pear grower in the Hood River Valley, set out to co-establish this company to help increase pear consumption. These fruit bars are available online and in many stores in the Pacific Northwest, check out where at http://www.gorgedelights.com/. The bars are made completely of natural fruit, with no added preservatives or sugars making an easy and healthy snack. Many flavors are available, but I recommend the original pear flavor!